People ask "how safe are these powered parachutes?" They are the most forgiving aircraft you can fly. You are flying under a parachute, so your recovery system is already deployed. If the engine quits, you still have full direction control and you land. As a safe pilot who has been flying these since 1992, I am always looking for good spots for a landing should this occur. The pendulum design of powered parachutes prevents you from getting into a position that could cause you to stall, and fall out of the sky. The pendulum system design is what makes a powered parachute so stable and forgiving. This is as close to flying with the birds as you can get in aviation today! Powered parachute, paraplanes, no matter what you call them, are a lot of fun, a real outdoor adventure. Some call it an adrenalin rush. Flying in powered parachutes low and slow, (at 28 to 30 MPH) taking in the view of the countryside, seeing things like rabbits scurrying about trying to get away from a predator like a coyote, or maybe deer or elk in some parts of the country. Flying powered parachutes allows you to safely get low over the open countryside, giving you a spectacular view, allowing you some great photo opportunities. You can also take pictures of your friends flying their paraplanes along with you, with the distant mountains as a backdrop. With proper flight training, you can earn your FAA powered parachute sport pilot certificate and you can easily fly your powered parachute over open country low for many miles with your best friend, wife or significant other along for the ride in your 2 place powered parachute, enjoying the feel of flight while the ground seems to rush by as you follow the dips & turns with your powered parachute. 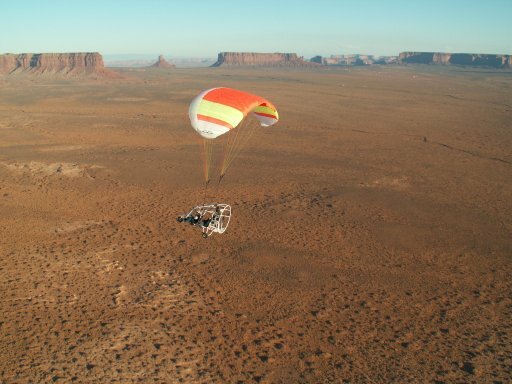 You can also enjoy spectacular vistas (like Monument Valley) from high above the earth, flying many thousands of feet up in the air, seeing for many miles in all directions while you seem to hardly move at all. Flying powered parachutes is the closest you may ever come to experiencing a magic carpet ride. (c) Copyright 1996-2016, Inland Paraflite, Inc. All rights reserved.